The famed French footballer, Eric Cantona once said “You can change your wife, change your politics, change your religion. But never, never can you change your favorite football team.” Sports teams and players hold an immutable place in our cultural conversation. And their ability to inspire consumer engagement is unique. When experts attempt to gauge the value of influencers, they often refer to the #PRRR model. The name of the model refers to Personality, Reach, Resonance and Relevance. Few social influencers can claim greater deliverance on these 4 values than the players of our national pastime. No other industry inspires quite the same devotion from its followers as sports. There is even a term to describe the enthusiastic and often lifelong follower of a team or player—Fan…or Fanatic. Most products, categories or services have a maximum level of frequency, at which no further purchase or engagement is needed for a time. Clothing, CPG, vehicles, etc. all reach points where even the top 20% of brand users will reach a threshold in consumption. But sports products and services have relatively no ceiling. So, the key then is to craft marketing programs and offerings that allow brands of all stripes to tap the effective jet stream of pro athletes. At Flint & Steel we’ve spent the better part of a decade crafting bespoke marketing solutions that allow brands to enjoy the durable and effective mojo of our national sports heroes. From Nascar’s Acceleration Nation, which allows brands to deliver meaningful S.T.E.M. programs in-school, to the fitness fomenting NFL Play 60, to dozens of products and promotions, we’ve helped define the way sports can invigorate commerce. This year we’ve been enlisted as the exclusive marketing partner for MLBPA to allow brands to leverage these dynamic players locally, nationally, as influencers, in content, promotions, events and more. 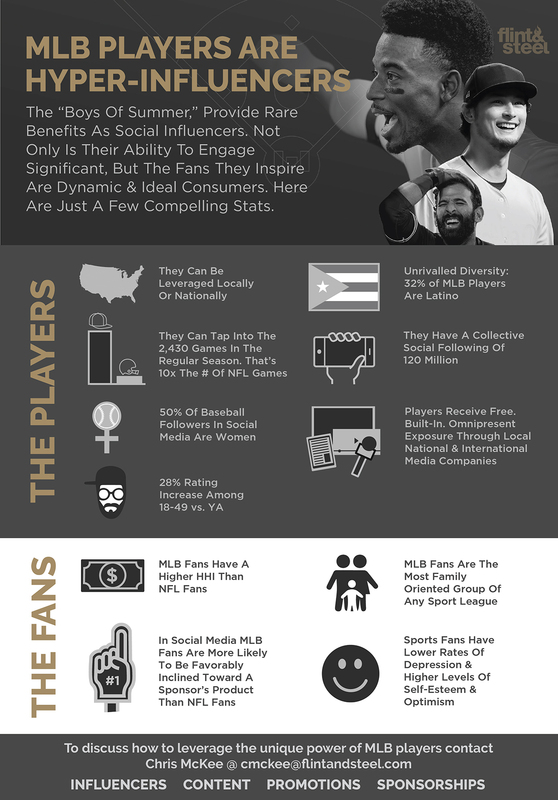 Contact Chris McKee cmckee@flintandsteel.com to discuss how you can tap into the players of the MLB to turn your consumers into fanatics.